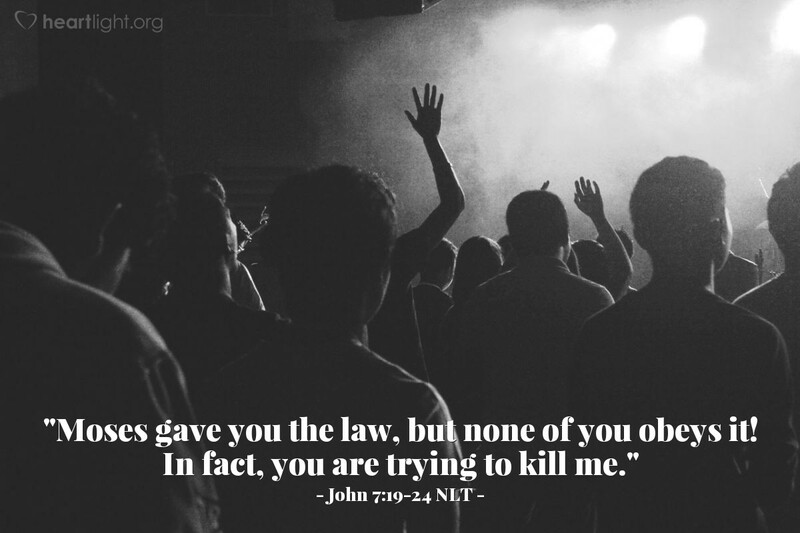 [Jesus said,] "Moses gave you the law, but none of you obeys it! In fact, you are trying to kill me." The crowd replied, "You're demon possessed! Who's trying to kill you?" Jesus replied, "I did one miracle on the Sabbath, and you were amazed. But you work on the Sabbath, too, when you obey Moses' law of circumcision. (Actually, this tradition of circumcision began with the patriarchs, long before the law of Moses.) For if the correct time for circumcising your son falls on the Sabbath, you go ahead and do it so as not to break the law of Moses. So why should you be angry with me for healing a man on the Sabbath? Look beneath the surface so you can judge correctly." Jesus looks through the duplicity of his accusers and sees the bare, naked ugliness of their warped religion. He knew they were after him, not because they supported the truth, but because they twisted the truth to fit their own prejudicial and traditional conclusions. The heart of the law Moses passed on to them from God was not their plumb line; instead, they made Moses fit their understanding. In the process, the heart of God got lost in all the distorted religious practice. Isn't it interesting that we can so clearly see this problem in them and miss it in ourselves?! Isn't it convicting that we can see this problem happening to other groups or to other people, but miss it when it is happening in our own hearts? Our own traditions, behaviors, and practices can literally blind us to God's truth. So before we get ready to pass judgment on others, let's take time and humbly ask our God for wisdom and clarity as we seek his will. Father, I come to you acknowledging that my insight is shallow and my wisdom is very limited. I do want to stand for your truth. I don't want to see your will watered down by fuzzy, conviction-less discipleship. At the same time, Father, I don't want to find everyone else's faults while justifying my own. Please give me wisdom so that I can live my life for you truthfully with integrity, compassion, and honor. In Jesus' name, I pray. Amen.